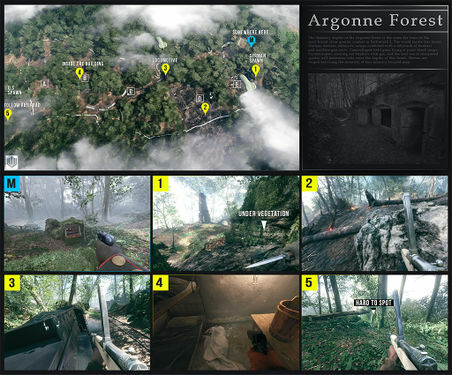 This wiki page documents the ARG that is hidden in Battlefield 1. This page includes step-by-step instructions to unlock the secret A Beginning, A Conflict, An Omen, Angel Sighting, and Belly of the Beast dog tags, the An Escalation skin, as well as the Peacekeeper revolver and its associated service dog tag called An Awakening. 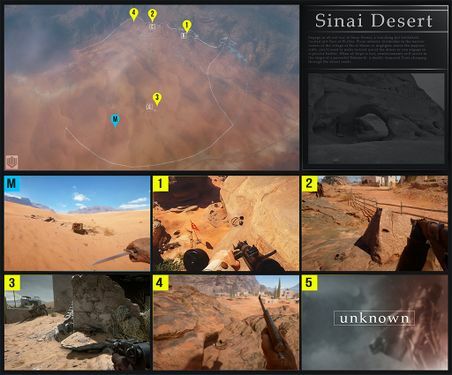 Currently, the primary solving hub for this ARG is the Battlefield Easter Egg community, who have a Discord server here, a wiki here, and a YouTube channel here. 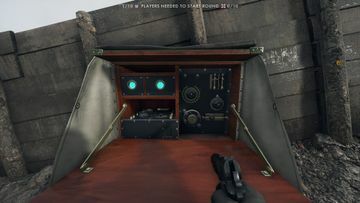 One pair of headphones is hidden on each map. The headphones are indestructible and can be located on every server, as long as they have not already been picked up. 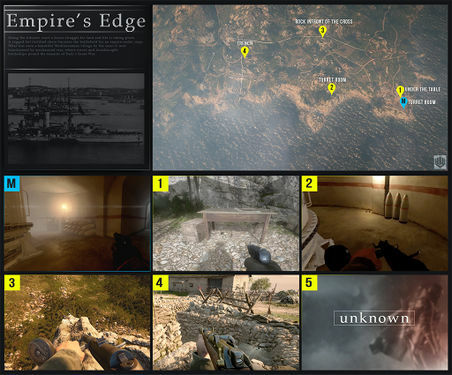 It appears that there are 5 spawn locations per map, although some of them remain undiscovered. The headphones can be picked up by any player by walking over them. 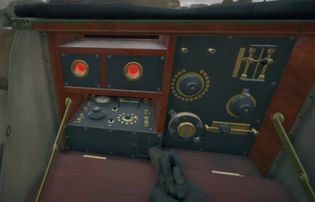 Upon approaching a hidden telegraph station after having retrieved a pair of headphones, the player will hear some Morse code being tapped out. 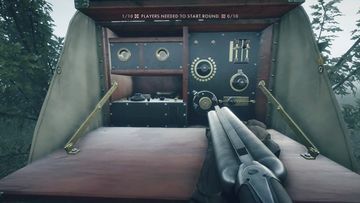 A player can carry only one pair of headphones at a time, and only the player wearing the headphones will be able to hear the Morse code when near enough to a hidden telegraph station. 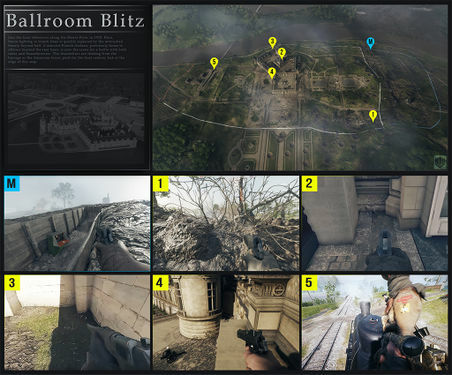 Here is is a series of images which display locations of headphones and telegraph station on each map. 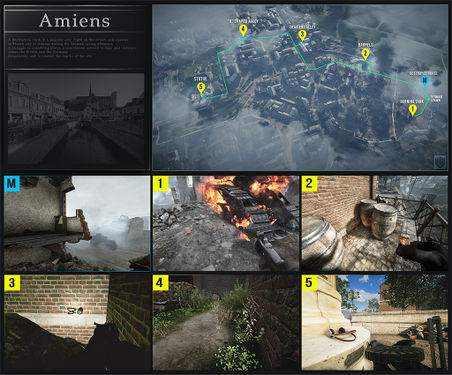 In order to hear the Morse code, the player needs to pick up the headphones from one of the 5 locations on each map (It might be necessary to check all 5 locations before finding the headphones) and bring them to the telegraph station. When the headphones and telegraph stations were first discovered, the Morse code was meaningless gibberish. 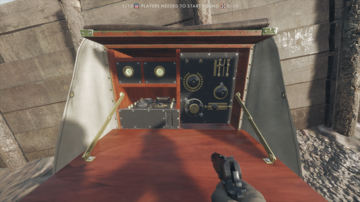 However, the contents of the Morse code changed in future patches. .--. .-. . ...- .. --- ..- ... | -- . ... ... .- --. . | -.-. --- .-. .-. ..- .--. - . -..
GO STRAIGHT TO <location_name>. OLD METHODS COMPROMISED. MUST ACQUIRE NEW KEY. WILL MISS DROPOFF IF DELAY OR INCORRECT LOCATION. The message will repeat until you move away from the telegraph station, at which point the telegraph station will explode. 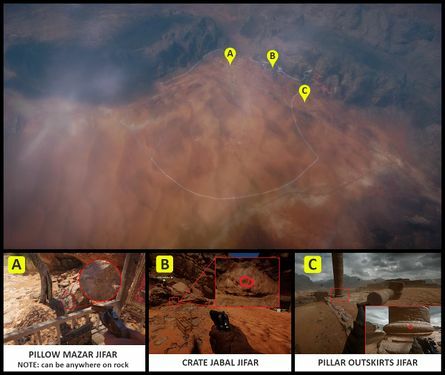 Each of the locations mentioned above has a symbol near it. 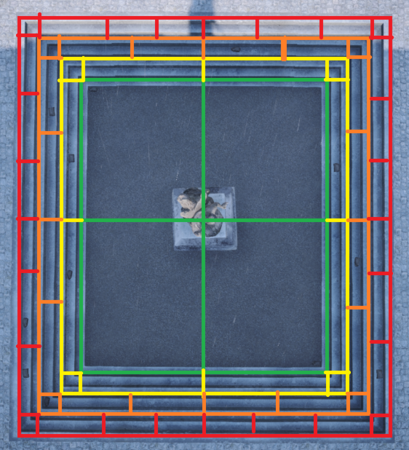 The first symbols discovered at each location are difficult to find; they are small double arrows pointing to the left and right, and only appear when the player comes within 0.4 meters. 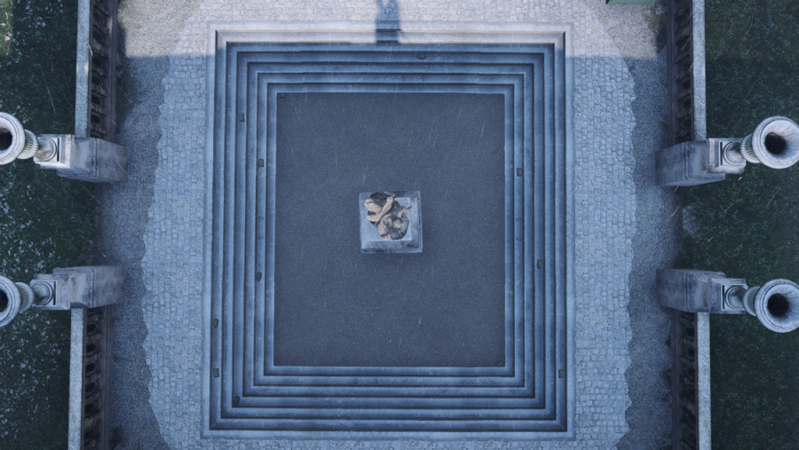 A player will typically need to crouch or go prone in order to be able to see their symbol. Additionally, players can only see the symbol at the location they've been "assigned" to. When examining a symbol up close, a distinct sound is played (video). 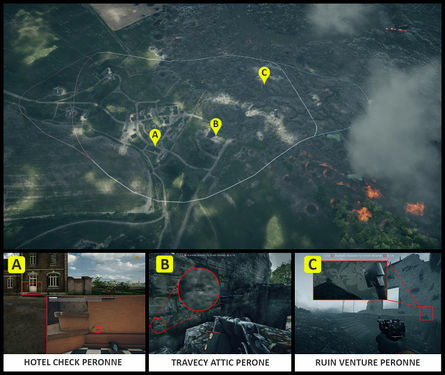 Pictured below are all 27 symbol locations, sorted by the map they appear on (maps made by Darrel). 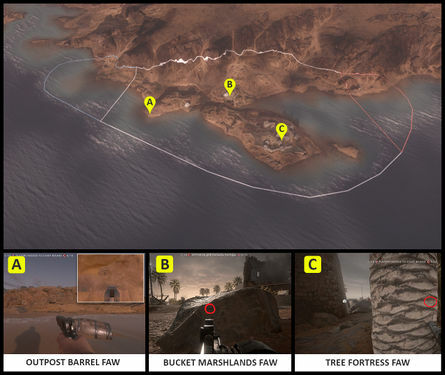 NOTE: If you're having trouble finding your location with the images below, Jambajeww has made a video guide for all 27 locations, with timestamps for each location in the description of the video. <reversed_location_name> REMEMBER FIRST RULE. IF COMPROMISED L PILL. An L PILL is short for lethal pill, a pill intended to be taken by soldiers to commit suicide rather than be tortured. Visiting the specified reversed location, the second location, yields a triangle symbol in place of the normal double-arrow symbol. 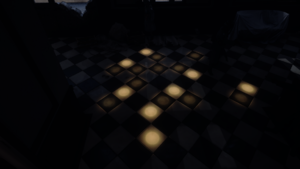 The second symbol appears in the exact same spot that the first symbol may appear for other players. Solving the Atbash cipher in the message yields another location from the list above. Visiting the third location leads to an arrow symbol pointing right. Solving the ROT cipher with a key of 7 (N = 19) yields another location from the list of locations, leading to a fourth symbol, which is shown on the right. To get the plaintext, the ciphertext must be reversed and decrypted using the rail fence cipher with 5 rails, and 0 offset. Note that the previous symbol, the fourth symbol, is in the shape of a fence, which may be interpreted as a hint for the correct decryption method for this cipher (rail fence cipher). The fifth symbol is a pattern of broken and unbroken dashes. Note: the cipher on this stage can also be solved as an anagram. The "double_cipher" is comprised only of single dots and single dashes: E's and T's in Morse code. The cipher can be solved by converting the transmission into A's and B's, where A is a dot and B is a dash. Then decode the ciphertext (AABBABABBAA etc) using a Baconian cipher, then decode the output of the Baconian cipher with an Atbash cipher to obtain another location from the list. Visiting the sixth location yields the sixth symbol: a series of horizontal and vertical lines with the name "EDWARD" prominently featured between them. 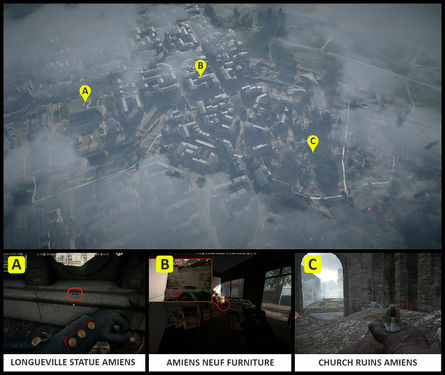 In the example above, LUGGAGE BASEMENT VARENNES may be replaced with any of the locations from the complete list. Going to the specified location reveals the seventh symbol, which prominently displays the word "George" above a crude drawing. 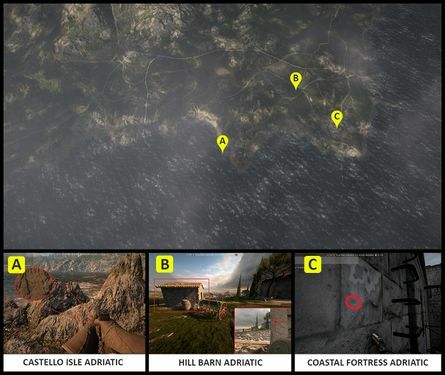 In the example above, HILL BARN ADRIATIC may be replaced with any of the locations from the complete list. The eighth symbol, which is just the word "LONDON", will be at the specified location. 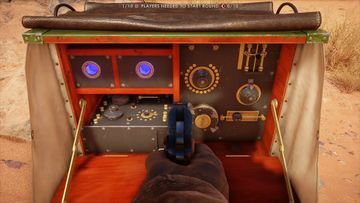 The final Morse code, once deciphered, directs the player to the balcony of a windmill on the map Giant's Shadow; specifically, the windmill nearest to the German Empire deployment. Standing on the balcony of the windmill and looking outward/slightly upwards (video) while waiting for exactly two minutes will trigger a courier pigeon to swoop past the player. 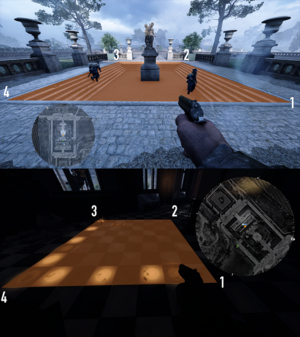 The same dramatic sound effect heard when viewing the symbols will play, and it is a this point that a new dog tag becomes available to the player. The tag is named "A Beginning", and has the description "You've found something that does not belong to you.". It should be noted that a player will only be able to trigger the pigeon if their telegraph station is on the cyan lights stage (stage 9) - you cannot skip the previous stages. If the dramatic sound does not trigger when the pigeon passes, the process must be repeated until the sound is triggered. Some reports indicate that the sound will not trigger unless the pigeon passes through the player, touching them. Nonetheless, if the pigeon is flying past you, you are at the right stage and have completed the necessary prerequisites. The code repeats indefinitely. The meaning of MASTER MAN has yet to be determined, and the whispering/screaming noises in the background have yet to be clearly transcribed. It has been noted that the Morse code definitely has a space between "Master" and "Man". One theory is that MASTER MAN refers to a radio operator, as shown below. 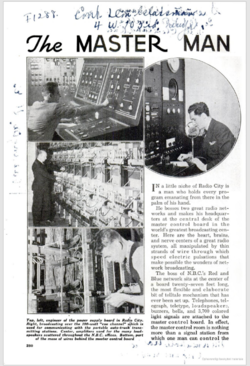 As shown, he has access to telegraphs and colored light signals on a master control board. 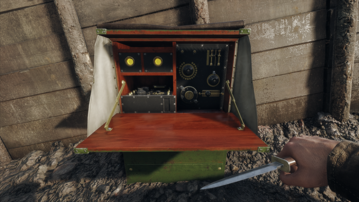 Through an in-game message by a DICE employee, we were told that "Red is a signal color", in response to queries about the telegraph station's red light. Between its color channels, this image contains all of the symbols mentioned above. 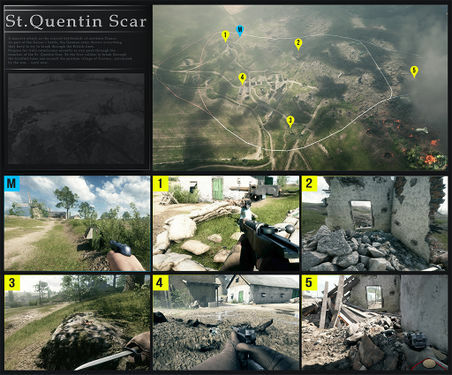 On July 20, 2017, another map was added to the game called Prise de Tahure. 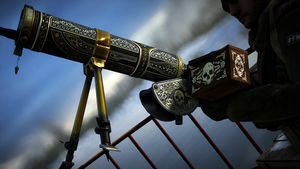 Located on the map were several records, along with a gramophone, much like in the Megalodon Easter egg. Bringing a record to the gramophone makes it play the Battlefield 1 theme tune. At this time it is unknown if the records and gramophone have another purpose. 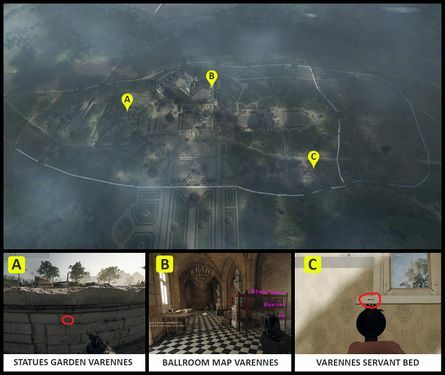 It was discovered that destroying every light source in the château on the Soissons map causes a mechanical sound effect to play. After doing this, the bases of the candle stands become interactable - players can switch them on or off. Interacting with candles causes the states of surrounding candles to switch, along with the position in that candle's cycle. There are a total of 7 candles in the château. Once all the candles have been illuminated, another mechanical noise is heard, which allows us to advance to the next stage. The seven candles each switch the state of one or more others. When any candle is activated, the candles' functions would rotate one position counterclockwise (explained more here) around themselves. By activating a single candle seven times and recording the results, you can learn all of the switch patterns and know they are back where they started. With this knowledge it is possible (with some brain bending) to work out how to illuminate all the candles. This could of course be done with pen-and-paper, but there is an Excel spreadsheet (link may expire, made by Disposalist) as well as an app that may also prove useful. Also, after pressing a candle seven times, only one candle's state will be changed. All candles go back to their original states after a candle has been pressed fourteen times. Note: If you don't press anything for 4 minutes the candles will reset and the switch patterns will change! After lighting up all the candles in the château and hearing the second mechanical noise, some wall panels on pillars on the outside of the château become interactable. There are 8 pillars on the north side of the château, and 8 on the south side. To the northeast of the château, there is a statue sunk into the ground, along with concentric square steps leading down towards it. After the second mechanical noise is heard, a randomly-generated pattern of sandbags appear on some of these steps. They only appear while no one is near the steps. The goal here is to manipulate the floor lights inside the château so their pattern matches the pattern of sandbags around the statue. The pattern of tiles inside the château consists of an 8 by 8 grid. At the beginning all tiles are turned off. Each individual tile can be manipulated using a pair of wall panels. There are 8 panels on the north side of the château, and 8 panels on the south side - each panel corresponds to either a row or a column on the grid. Pressing the pair of panels corresponding to a specific row and column cause the appropriate light to toggle on or off. For example, if you were to press the "2nd column" panel and the "4th row" panel, then the light in position (2, 4) on the board would be toggled. However, there is a twist: the rows and columns the panels correspond to are completely randomized in each round (or pre-round). There is no grouping to the panels; for example, not all panels on the north side are the row-controlling panels. 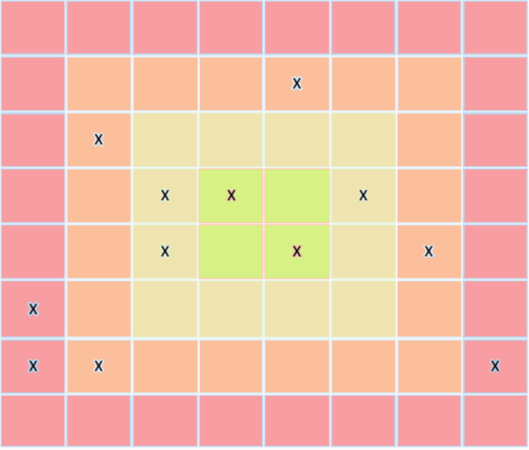 This randomization means that players need to use trial and error in each round (or pre-round) in order to determine which panels activate which rows and columns. Check the light grid. If no lights have changed, pick a new panel as your second panel, and try pressing it along with your first one. Repeat this until a light changes on your grid. Once a light on your grid has changed, note its position in the grid along with the panels you used to activate it. Pick a different panel that you haven't tried yet as your second panel, keeping the first panel the same. Continue to try new combinations that include the first panel until another light is toggled. By this point, you should have toggled 2 different lights, and you should have had 1 panel (the first panel) in common with both of those lights. The two lights you toggled will share either a row or a column on the grid. The panel the lights had in common (the first panel) can now be associated with the row or column that contained the toggled lights. The other 2 panels you pressed can be associated with the intersecting rows or columns. Repeat the whole process, starting with a different panel. Continue until every panel's row or column is identified. Let's say we start out trying to identify Panel 1. We try pressing Panel 1 and Panel 2, but nothing changes, so we move on. We try pressing Panel 1 and Panel 3, and a light changes at position (1, 5) (first column, fifth row). We note this down and move on. We try pressing Panel 1 and Panel 4, but nothing changes. We try pressing Panel 1 and Panel 5, but nothing changes. We try pressing Panel 1 and Panel 6, and a light changes at position (6, 5) (sixth column, fifth row). We note this down. The two lights that changed were both part of the 5th row, and we pressed Panel 1 in both cases. Therefore, Panel 1 must be the button for the fifth row. In addition, from the first light that changed, since we know that Panel 1 is the button for the fifth row, Panel 3 must be the button for the first column. 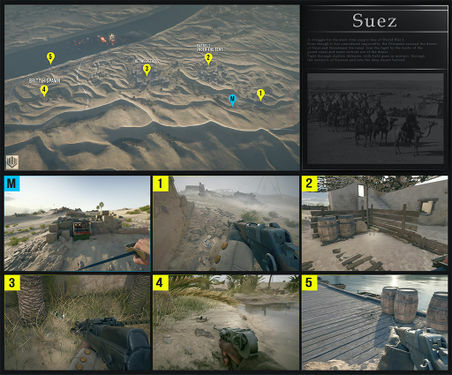 Similarly, from the second light, since we know that Panel 1 is the button for the fifth row, Panel 6 must be the button for the sixth column. From here, determining the rest of the panels' functions by trying unknown panels with known ones is easy. Note: If a given pair of buttons causes no change in the light grid, they must both either be for rows or columns, since they do not intersect. Once each panel's functionality has been determined, matching the lights up with the sandbags is a fairly simple (if tedious) task. The sandbags appear on only some of the concentric steps, which correspond to square "rings" on the light grid. The position of the sandbags along each step indicates that the light in the corresponding location on the grid needs to be turned on. All other lights need to be turned off. 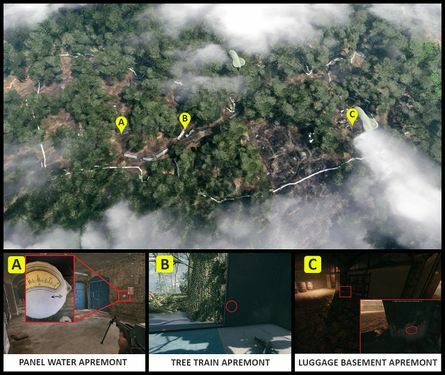 Once the tile/sandbag puzzle has been completed, a plume of black smoke appears, and the A Conflict dog tag is awarded to the player who activated the final panel - the dog tag is NOT awarded to all players on the server, only the person who completes the Easter egg! 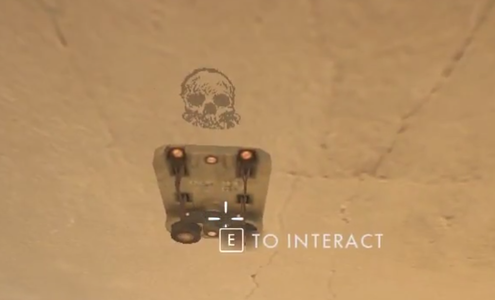 The dog tag has the same skull icon as the A Beginning dog tag, but is silver instead of bronze. 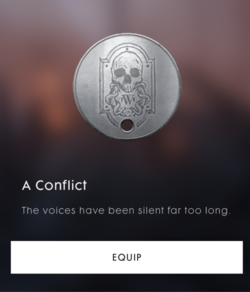 Note: The A Beginning dog tag is not required to unlock the A Conflict dog tag! The voices have been silent far too long. 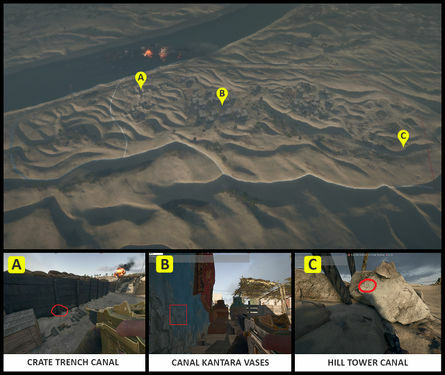 On December 11, 2017, the Turning Tides update was released for Battlefield 1. 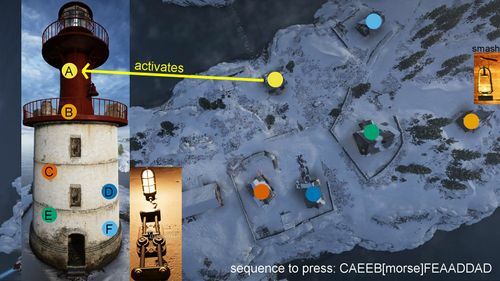 Little progress was made on this Easter egg until January 30, 2018, when mysterious Morse messages were added to the lighthouse on the Heligoland Bight map. These messages are only audible when the player is playing as the Infiltrator Elite class, and only one of these messages can be heard in any round. CODE COMBINED WITH THE LOCATION NAME THEN TEXT SPLIT IN SIX. 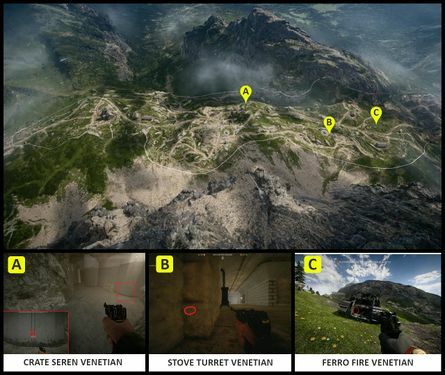 A PIECE HIDDEN IN EACH ZONE. USE THE NUMERIC KEY TO PUT THE PIECES IN ORDER AND SEPARATE THE LOCATION FROM THE CODE. GO TO LOCATION AND USE THE CODE. TO MAINTAIN SECURITY CHANGE THE THIRD ONE OFTEN. LOOK IT UP EVERY TIME YOU GET THERE. THE LOCATION OF THE FIFTH ONE WAS CAREFULLY CONSIDERED. AFTER YOU SEE YOU ARE DONE ENTERING THE CODE... HURRY. Each message also ended with RELAY THIS MESSAGE TO OUR SIX OPERATIVES IN THE SNOWY REGIONS. 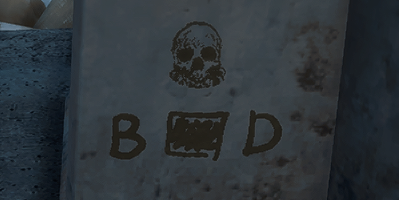 These clues were used throughout the Easter egg. 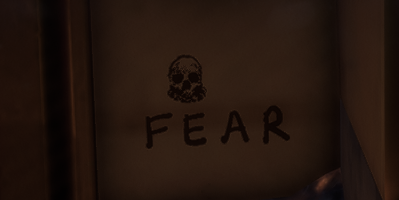 Appears above a switch, hidden behind a cupboard in a house. 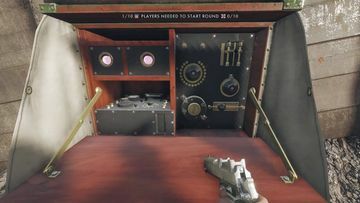 Pressing the switch is a step to reveal Morse code, which is unique for each player - it must be LOOKED UP each round. Note: its location was "CAREFULLY CONSIDERED" - the blacked-out letter is an A, since the skull appears near Control Point A. No text, but standing in the southeast corner of the ruins causes a small orb in the opposite corner to flash out the following message in Morse code: TEST FAILED ANGELS LOOSE PROCTORS DEAD TRI ODIN NOLX ETYRE ODIN DWA. The Russian words at the end are numbers, translating to 310412. 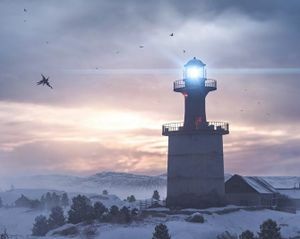 This produces the message SWORBE, the name of a lighthouse on Albion. Additionally, the location had to be SEPARATED from the code; accordingly, the remaining letters were isolated. Because the Morse explicitly stated that there needed to be 18 TOTAL, the third segment of code was determined to be 5 letters long. 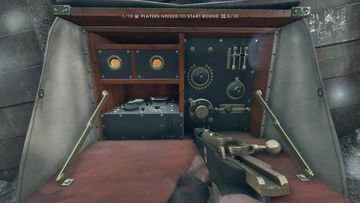 The switch beneath the Albion skull does not necessarily do anything by itself; in order to hear the Morse code required to complete the Easter egg, another step is required. The Morse found at the beginning of this hinted that the switches need to be numbered from TOP TO BOTTOM. 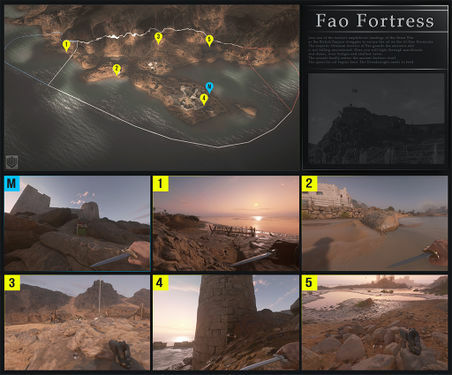 The top-most switch of the lighthouse is A and the bottom-most switch is F. The code CAEEB <5 letters of unique morse> FEAADDAD can now be entered. The An Escalation skin has a number of distinguishing features. 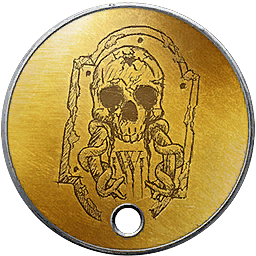 First, it is adorned with the skulls that have been prevalent all throughout the Battlefield 1 ARG, and have been present on the A Beginning and A Conflict dogtags. The number 0627 is also visible on the skin. Finally, some Morse code is visible on the skin, which translates to UNKNOWABLE. 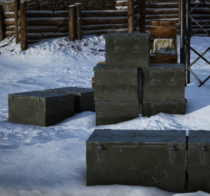 On January 30, 2018, the Turning Tides North Sea update was released. These numbers will be input into the generator rooms on Zeebrugge (near Control Points C and D). This is accomplished by using Morse code. A dot denotes a switch in the on position, while a dash denotes a switch in the off position. 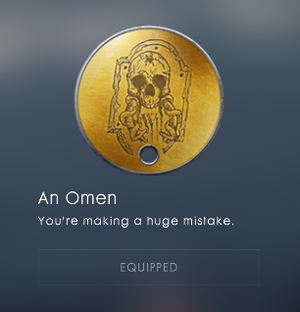 Upon putting the switches into the correct position, the An Omen dogtag is unlocked. 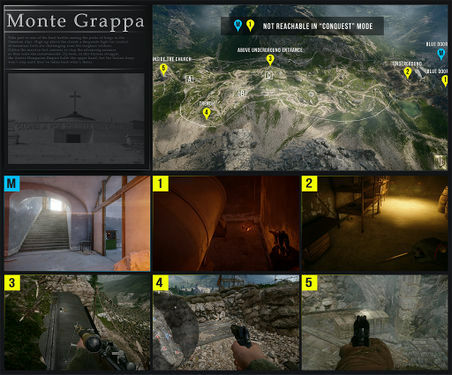 On June 27, 2018, the the final stage of the Easter Egg was released. 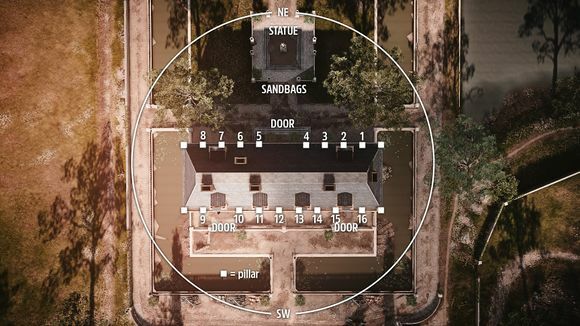 Using this hint, heading to the farm house on the south-western edge of the map and blowing up its chimney will reveal a switch that once pressed will trigger the next stage of the Easter Egg. After it has been pressed, the lights on the generator from the first step become interactable once again. Using them to enter 03222110, confirming each number with the top switch, will trigger a monster howl and unlock the Angel Sighting dog tag. Using the description of the Angel Sighting dog tag as a guide will unlock the Belly of the Beast dog tag. Heading to the angel statues on Carporetto, shooting off the head of the left statue, the wing of the right statue, the torso of the center statue and completely destroying the angel statue in front of them, will trigger a screaming sound and unlock a button on the base of the statue in the back. 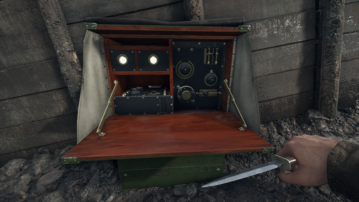 Pressing the button will unlock the dog tag. To continue further, ALL five Easter Egg dog tags as well as the An escalation skin have to be unlocked! 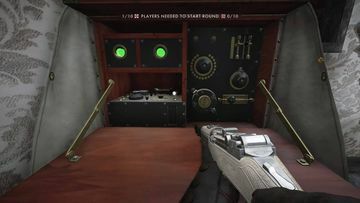 will make the player drop down to the final room where he will find the Peacekeeper revolver as well as a few wooden boards spelling out Simps. This might be a reference to Kevin Simpson from the Battlefield 4 Phantom Program. G Gaining 100 kills with the Peacekeeper will also unlock the An Awakening service dog tag. This page was last edited on 24 October 2018, at 17:41.